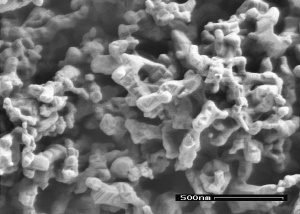 Nanoparticles of tungsten carbide and tungsten carbide cobalt can enter cultured mammalian cells. These are the findings of a study conducted by researchers from the University of Dresden, the Leipzig-based Helmholtz Centre for Environmental Research and the Fraunhofer Institute for Ceramic Technologies and Systems in Dresden. The results further show that pure tungsten carbide nanoparticles do not have cytotoxic effects. Only when the nanoparticles are mixed with a toxic substance, metallic cobalt in this case, are cytotoxic effects observed. The in vitro study, which was published in the renowned journal Environmental Health Perspectives, examined the effect of tungsten carbide and tungsten carbide cobalt nanoparticles with an aggregate size of 150 nanometres on cell lines of human lung, skin and intestinal cells and of primary cultures of rat brain cells. Tungsten carbide is used primarily in the heavy metal industry for the manufacture of tools. The addition of cobalt increases its toughness and strength. During the manufacture process workers may be exposured. But until now, no scientific findings on the effects of nano-sized particles of the material have been available. Before nano-grained materials are used on a large scale, the risks to humans and the environment need to be investigated and taken into account. The chemical and physical studies confirmed that both tungsten carbide and tungsten carbide cobalt particles are stabilised by albumin or serum in nutrient solutions. Adding albumin to the nutrient solutions makes it possible to carry out research in conditions that are very close to those found in exposed organisms. Using electron microscope methods it was possible to detect uptake of the particles by the cells under investigation. Subsequent biological tests showed that tungsten carbide nanoparticles alone are not acutely toxic, whereas combinations of these particles with cobalt did have toxic effects at high particle concentrations. The toxicity of the WC-Co mixture was higher than that of similar concentrations of cobalt ions. It is not yet entirely clear why the combination of tungsten carbide and cobalt is more toxic. It is possible that nanoparticles act as a Trojan horse, i.e. they increase the cell’s uptake of toxic cobalt ions. Further research is needed to clarify the effect of particle size and combination effects in order to draw conclusions about possible consequences for health risk assessments. These and other findings were discussed on 18 and 19 March 2009 at a symposium at the Helmholtz Centre for Environmental Research in Leipzig on `Nanotechnology and Toxicity in the Environment and Health´ by around 80 scientists and representatives of government bodies and industry. The symposium also marked the end of the INOS research project. The German Federal Ministry of Education and Research (BMBF) has provided funding for three large consortia (NanoCare, INOS and TRACER) totalling EUR 7.6 million. These are the first projects in Germany to have investigated health aspects of synthetic nanoparticles on a large scale. INOS focused on developing methods for assessing the risk potential of engineered nanoparticles with the help of in vitro methods. The research concentrated on ceramic and metallic particles such as diamond, tungsten carbide, titanium dioxide, titanium nitride, cobalt, platinum, ceramic metal compounds, carbon nanotubes and carbon black.